WASHINGTON, DC, June 4, 2013 (ENS) – Each year, June 5 is celebrated around the world as World Environment Day, and this year the focus of attention is on reducing food waste. In keeping with this effort, today U.S. EPA Acting Administrator Bob Perciasepe joined U.S. Department of Agriculture Secretary Tom Vilsack to announce the launch of U.S. Food Waste Challenge. The challenge asks farmers, processors, manufacturers, retailers, communities and government agencies to help reduce wasted food. “By joining together with EPA and businesses from around the country, we have an opportunity to better educate folks about the problem of food waste and begin to address this problem across the nation,” Vilsack said. Americans send more food to landfills and incinerators than any other single municipal solid waste – 35 million tons – even more than paper and plastic. When wasted food is sent to landfills, it decomposes and becomes a source of methane, a potent greenhouse gas that contributes to climate change. Reducing wasted food helps conserve energy and reduces environmental impacts from thee production and transportation of food. Around the world hundreds of thousands of people are already participating in World Environment Day events or gearing up to do so. Official events focus on the new UN Environment Programme and UN Food and Agricultural Organization campaign Think.Eat.Save. 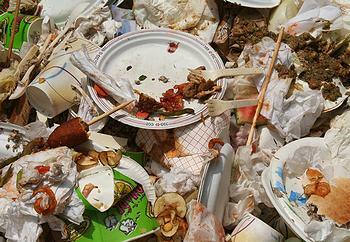 Reduce Your Foodprint, which is aimed at slashing food waste. Each year, an estimated one third of all food produced ends up spoiling in the bins of consumers, retailers, farmers and transporters. This 1.3 billion metric tonnes, worth around US$1 trillion, is enough to feed the 870 million people who go hungry each day several times over. This year the main World Environment Day event is hosted by the government and people of Mongolia, one of the world’s fastest-growing countries. While Mongolia as a whole does not waste much food, the traditional nomadic lifestyle of some of its people, who developed ways to preserve food for long periods, offers some ancient answers to the modern challenge of food waste. In Mongolia, festivities began on Saturday with International Children’s Day with environmental flashmobs in the Central Square of the capital city, Ulaanbaatar. On Sunday, thousands of runners took part in a marathon flagged off by current marathon world record holder Patrick Makau, the UNEP Patron for Clean Air. The runners passed through the streets of Ulaanbaatar on a day where the city center was designated car free. 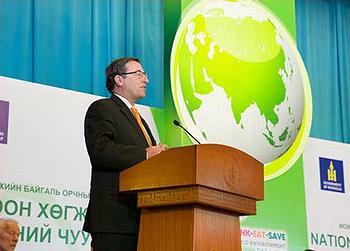 On Monday, Mongolia hosted a Green Development National Forum. The mineral-rich country has placed a moratorium on new mining concessions while looking to a more sustainable future based on renewable energy and ecotourism. Today, Mongolia flipped the switch on its first wind farm on Salhit Mountain in Tuv Province as part of the country’s transition to a low-carbon future. Also today, the Mongolia Renewable Energy Futures and Green Development conference is exploring the relationship between renewable energy and green development in Mongolia, where there is a potential to redefine rational and sustainable growth. At the conference, “Smallholders, Food Security and the Environment,” a report commissioned by the UN Environment Programme-World Conservation Monitoring Centre, UNEP-WCMC, and the International Fund for Agricultural Development, IFAD, was released. “Two decades of underinvestment in agriculture, growing competition for land and water, rising fuel and fertilizer prices, and climate change have left smallholders less able to escape poverty,” said UNEP Executive Director Achim Steiner. 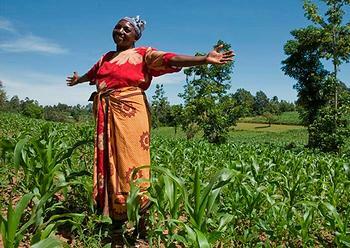 Most of the 1.4 billion people who live on less than US$1.25 a day live in rural areas and depend on agriculture for their livelihoods, while an estimated 2.5 billion people are involved in full-time or part-time smallholder agriculture, the report shows. These smallholders manage some 500 million small farms and provide over 80 percent of the food consumed in much of the developing world, particularly Southern Asia and sub-Saharan Africa, thus contributing to food security and poverty reduction. On June 5 the official World Environment Day celebrations take place, including the release of the working paper “Sustainable Food Futures,” published jointly by UNEP and the World Resources Institute, based in Washington, DC. Events are taking place on every continent across the world. UNEP Afghanistan is combining World Environment Day with a workshop on Afghanistan’s Sustainable Development Public Private Partnership. The workshop at Kabul University will address topics such as: waste management; sanitation; carbon dioxide reduction and recycling. In India, from Bangalore to Chennai, tens of thousands of young people will take part in runs, awareness-raising events and tree-planting ceremonies to highlight the issue of food waste and other environmental concerns. In Kenya, More than 2,000 volunteers from Action Green for Trade and Sustainable Development will reach supermarkets, restaurants and hotels with the message that reducing food waste and loss could have a significant impact on world hunger levels. Rose Festival Parade – Portland’s largest public event – themed this year in honor of World Environment Day. At a different Portland location, children are invited to dress as their favorite animals to participate in the Procession of the Species, a mini-parade around the waterfront. In Paris, UNEP’s Division of Technology, Industry and Economics is running a competition called Love Your Leftovers, which asks global citizens to show their love for leftovers and submit a recipe that will clean out the fridge. The overall winning recipe and contributor will be announced on June 5, with a top mystery first prize up for grabs and 20 exclusive Vivienne Westwood GreenUp! t-shirts going to runners-up. The competition is supported by “20Minutes,” a free newspaper that can be picked up around Paris and on the Metro. On June 5, 20 Minutes will also publish an article to announce the winner and to propose some practical tips to prevent food waste. In addition, hundreds of electronic billboards around Paris will feature the Think.Eat.Save campaign slogan and a link to the World Environment Day website: http://www.unep.org/wed/. In the Nordic-Baltic region, a new advertising competition will be launched on June 5, calling on professionals and non-professionals alike to create a newspaper ad that will inspire people to think about the detrimental effects of food waste and loss. The contest, to be kicked off by the United Nations Regional Information Center, the Nordic Council of Ministers and UNEP, will be open to participants from Nordic countries and its Baltic partners – Estonia, Latvia, Lithuania and Baltic Russia. The winner will be announced at a Feeding the 5000 event in Copenhagen on October 4 and will be awarded the Nordic Council of Ministers Prize of 5,000 euros.